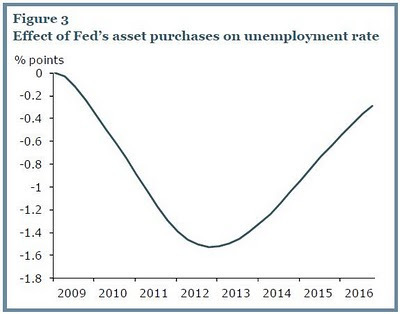 Just out, another Federal Reserve Bank of San Francisco Economic Letter featuring another model. 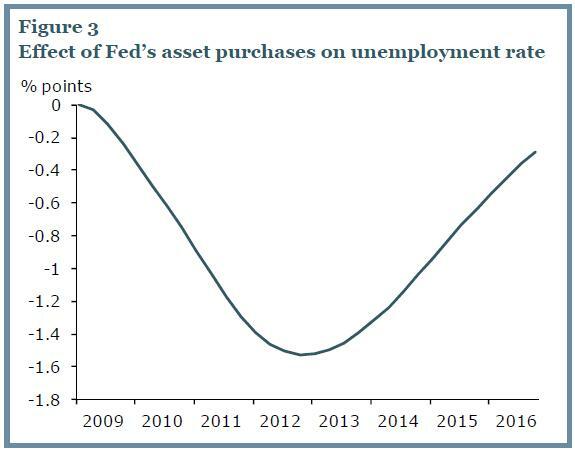 That is, the buying spree will have lowered unemployment by a point and a half by (important bit this) 2012. Or, in other words, the Fed will have created 3 million jobs. Nice. Course, that does pan out to $573,000 (keep the change) per job. But this was not just about jobs was it? D-E-F-L-A-T-I-O-N! "The simulations also suggest that the longer-run inflationary consequences of the program are likely to be minimal, as portfolio-balance effects rapidly fall to zero and conventional monetary policy adjusts to bring conditions back to baseline. In part, this long-run neutrality reflects that agents in the model have confidence in the FOMC’s determination and ability to maintain price stability—a belief that policymakers ratify." Que? Whatever - it's all good - bring on QE3, baby.